Worry. It’s a sneaky thing. Worrying is just a symptom of fear. It is actually a very comfortable place for your ego personality to hide out. It becomes consumed and distracted running through all the negative possibilities that it can imagine might happen. It is endless. Once you have developed the habit of slipping into worry, it can become a part of your daily script. It can become overwhelming and pervasive. I recently heard someone say they were worried about going out shopping because they might get hit by a car…….. ! You can see how far this can go, it can get crazy. Sometimes having a bit of worry is OK, it could be just a fleeting thought of concern that acts like a warning signal. It’s telling you to remember something that could come up later or reminding you to take some other proactive action. This is not really worrying. The worrying I’m talking about is all consuming. It becomes a filter that you see the world through. In general worrying is self-indulgent and really very polluting and toxic, first to anyone you are ‘worried” about and then especially to yourself. By worrying about someone, you place a huge burden on that person. You are taking any fears or doubt they may already have and bringing their focus onto it and then they really start to worry and it expands…..
Not to mention how much you are trashing your own energy by focusing on negativity. And by worrying and thinking about negative possibilities you are actually attracting the negative results you are worried about! You are sending out the vibration of what you don’t want instead of what you do want as an outcome. And that’s what you’ll get- the exact thing you were worried about! There is a concept called “Pareto’s Principle” or the “80/20 rule”. It says that 80% of the things you worry about won’t happen and the 20% that do happen won’t be as bad as you thought it would be. So try to remember that. But how do you shift from living in fear or worry? You need to move up a level or two on the emotional scale. It’s difficult to shift in one fell swoop into very high energy level, it is much easier to move up incrementally. Try this. The next time you feel yourself worrying, sit down and draw a line down the middle of a piece of paper. (This is a variation of an exercise called “Clarity through Contrast”). On the left side, write down what you are worried about (what you DON’T want). You can list several things or just the dominant worry you are having today. On the right side, write down what you would prefer to happen (what you DO want). Now go down the list of items, which thought feels best? What you DON’T want or what you DO want? When looking at what you DO want, try to see how it would look and how it will feel when it happens. It feels better, right? I’ll bet much better. By focusing your attention on the desired outcome and feeling it, you can shift towards new possibilities instead of being mired in limitation. So the next time you feel yourself slipping back into worry, try to remember what you DO want. Or since it is difficult to stop some thoughts, (you can try saying “cancel!”, it works for me) tell yourself I’ll think about that later, then when you can, take another look at your list. 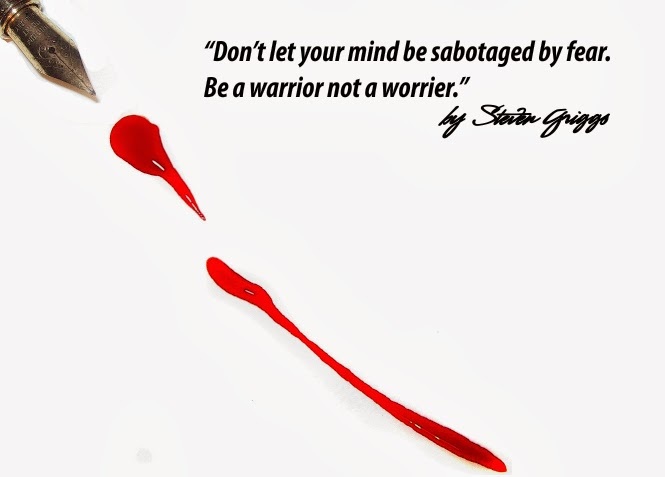 Don’t let your mind be sabotaged by fear.